The UniLaSalle community has been an innovator in both earth and life sciences. Our disciplines, which include agriculture, the food industry, food & health, geology, and environmental studies, prepare our students – as future entrepreneurs – to face the social issues and environmental challenges of tomorrow’s world. UniLaSalle and its partners have been innovating to expand locally while maintaining contacts internationally. UniLaSalle approach to research is unique in the sense that we believe in concrete solutions and in bridging the gap between fundamental and applied research. This ambition has driven our choice to favor projects specific to our establishment which are led by research lecturers from our faculty. This means that each academic specialization we offer is backed up by an extensive research program that focuses on some of today’s major issues. It’s this quest for excellence and pragmatism, combined with a work ethic centered on collaboration that defines our research. We aim to offer the best teaching practices and research capabilities, by providing a demanding curriculum that incorporates the latest advances in knowledge. We consolidate theoretical learning through close links with the world of industry and business. Our links with the business community offer key advantages. We can adapt our programs to socio-economic demands and change. Our students are given a clearer idea of their career options and can be more easily productive in their first job. Our Alumni are managers, recognized for their all-round excellence, and their leadership and team-building qualities. UniLaSalle has the objective to train competent engineers, aware of tomorrow’s challenges and equipped with the necessary knowledge, expertise and interpersonal skills to tackle them. By fostering the values of respect and commitment and a sense of community, it is our aim to train responsible young people with a broad outlook on the world around them and a sustainable. More than 220 partner universities worldwide in order to develop student exchanges, joint academic and research projects. UniLaSalle has set up a Regional Chair of Excellence in Plant Breeding, Plant Improvement and Social and Technical Integration with co-funding from the Picardy Region and FEDER and supported by the French Association of Seed Companies and Breeders. In the framework of this Chair UniLaSalle has committed to offer an international applied Master programme in Plant Breeding and two research areas: 1) Analysis of the integration of new techniques and technologies in the selection of varieties 2) Social acceptability of scientific progress in the field of plant biology. 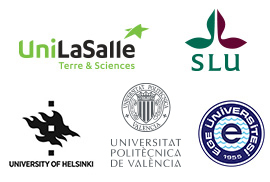 UniLaSalle has strong links with French and international seed companies and regulatory authorities as well as international renowned universities in the field of plant breeding. The Master program in Plant Breeding of UniLaSalle was designed in partnership with seed companies and the food industry and has been highlighted by the ETP Plants for the Future as example for producing talents who master conventional and biotechnology related plant breeding techniques. The aim is to train students in new technologies in molecular and cell biology which can then be used to help increase agricultural yield. Become a field breeder or plant developer with the ability to grasp and manage the scientific and technical interdisciplinary between biotechnology, agronomy, plant biology, genetics, regulatory issues and markets. The program covers the entire scope of a modern-day plant breeder’s work.